Cap 1-3 cm broad, convex, plano-convex in age; surface smooth, sticky when moist, disc reddish-brown to yellow-brown shading to a cream-colored margin, in age sometimes entirely dark, tawny-brown; flesh soft, white, thin; odor and taste mild. 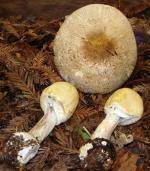 Gills adnexed, broad, close, white to cream, slowly bruising brown. Stipe 1.5-7 cm tall, 0.2-0.7 cm thick, cartilaginous, equal to tapering downward, finely pubescent, pallid to cream above, blackish-brown at the base, at maturity almost entirely blackish-brown except the apex; veil absent. Spores 7.0-8.5 x 3.5-4.5 µm, elliptical, smooth; spore print white. 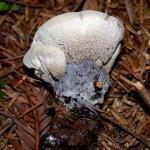 Solitary to clustered on hardwood stumps and logs; fruiting from late fall to mid-winter. Flammulina velutipes is recognized by a sticky, orange-brown cap and dark, finely pubescent stipe. In coastal Northern California it is extremely common at the base of senescent bush lupine (Lupinus arboreus). 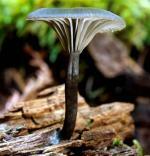 This species is commercially grown, sold in many markets under the name enoki. 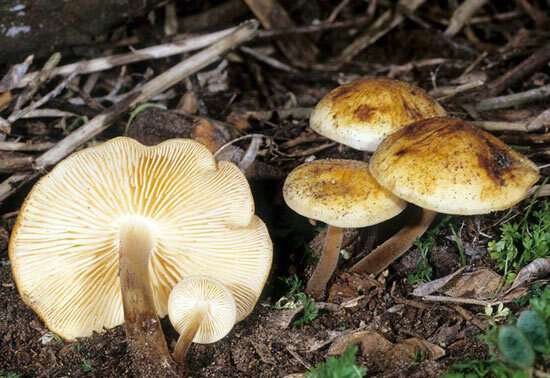 The cultivated product, which is grown in the dark and as a result has long, slender, pale stipes and tiny caps, bears little resemblance to wild material.